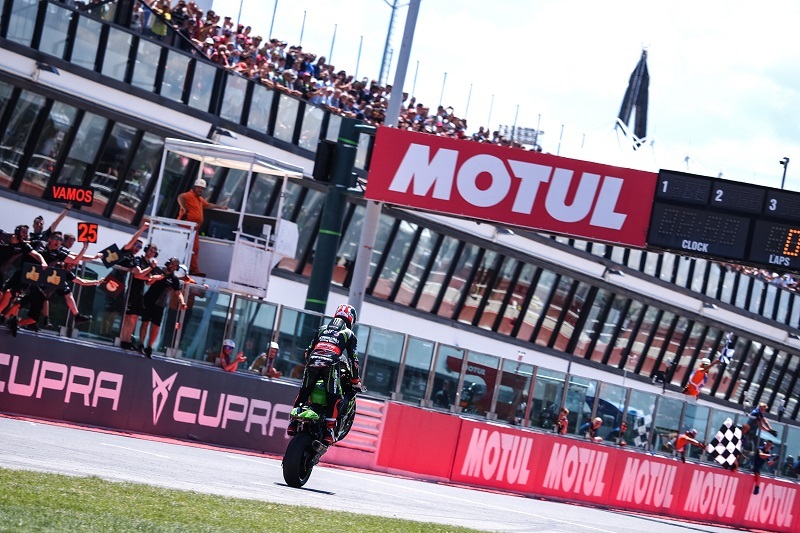 Jonathan Rea (Kawasaki Racing Team WorldSBK) had his Superpole snatched away in the closing seconds of Superpole, but that mattered little to the reigning champion by the time Race One rolled around. A fantastic start from the Kawasaki rider shot him ahead of Tom Sykes (Kawasaki Racing Team WorldSBK) at the lights, and with an open track ahead, Rea proved to be unbeatable once again. There was a stunning battle for the podium however as Chaz Davies (Aruba.it Racing – Ducati) and Eugene Laverty (Milwaukee Aprilia) completed the podium in the 21 lap race. With Rea flying away into the distance, Davies finally managed to catch the Aprilia by lap 16. Laverty went very wide going into Turn 16, a mistake that Davies welcomed going through the straight. It’s the Welshman’s third consecutive second position and yet another solid ride this season. Leon Camier (Red Bull Honda World Superbike Team) returned to the top ten after a disappointing GEICO US Round with ninth place on Saturday. Leandro Mercado (Orelac Racing Verdnatura) meanwhile scored only his fourth top ten finish of the season, coming in behind the Honda in tenth. Alex Lowes (Pata Yamaha Official WorldSBK Team), who was until today the sole rider to score points in every race of 2018, crashed twice and was unable to finish. WorldSBK is back tomorrow with Race Two, live from Misano at 13:00 local time (11:00 GMT).